Died: 15th May 1915; age 17; KiA. Rank: Private; Service Number: 1888. 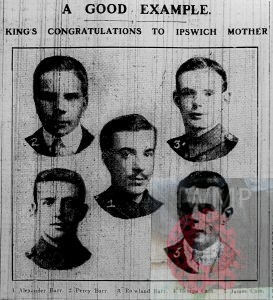 Relatives Notified & Address: Son of George Henry & Elizabeth Cain, of 82, New Cut West, Ipswich. 1901 ‘Horse & Groom’ Tavern, Woodbridge Road, Ipswich. Percy was 3 years old and living with his widowed mother & siblings. Elizabeth Barr (nee Alexander), 32, an Inn Keeper, born Nowgong, India. Rowland Barr, 7, born Ipswich. Ella Barr, 6, born Ipswich. 1911 82, New Cut West, Ipswich. Percy was 13 years old, an Errand Boy – Dairy. He was living with his mother, siblings, step father & step brothers. George Cain, 42, a Checker of Ship’s Cargoes, born Walton. 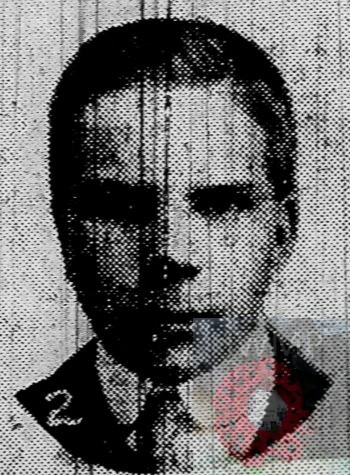 George Edward Cain, 17, a Railway Storekeeper Assistant – G.E.Railway, born Ipswich. James Henry Cain, 13, an Errand Boy – Sail Maker, born Ipswich. Alexander Barr, 18, a Clerk – Milling Engineer, born Ipswich. Roland Barr, 17, a Bottling Brewery. Ella Barr, 16, a Mother’s Help – at home. Percy’s father was George Barr, born 1856, Shoreditch, Middlesex – died 1900, Suffolk. Soldiers’ Effects to Elizabeth Cain – mother. “Madam, I am commanded by the King to convey to you an expression of His Majestry’s appreciation of the patriotic spirit which has prompted your five sons to give their services to the Army.